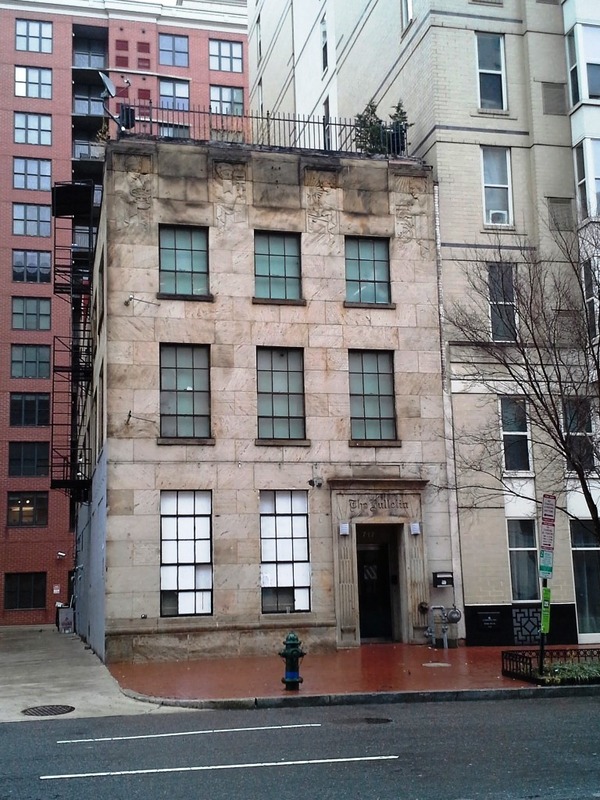 1) Muse Nightclub (717 6th St NW) – This address has been a nightclub or bar for a LONG time and the latest incarnation, Muse, quietly closed its operation in late January. This linked article provided by a Penn Quarter Living reader provides most of the history behind this address and the confirmation that Muse is closed, but we can also add that after the MCI (now Verizon) Center opened in 1997 and before 2005 this building was home to The Rock, a multilevel sports bar. The club’s website is no longer in operation either. The web page to market the property to another prospective tenant is already up. Photo sans Muse signage is shown below. 2) Tuscana West (1350 I St NW) – This I Street Italian restaurant across from Franklin Park held its last night of service this last Wednesday after a twenty (20) year run. It opened in 1993 and was one of the survivors from before downtown’s development resurgence. We did enjoy dining here and are sad to see it go. The same owner runs the recently opened Catch 15 restaurant/oyster bar on K Street…we’ll definitely be stopping by for oysters. 3) Osteria Elisir (427 11th St NW) – The closing of Elisir caught us by surprise as there was no doubt that the Italian food here was good the couple of times we posted up in the dining room or at the bar. The news broke on Don Rockwell’s forum site and all the usual foodie/business media outlets mentioned this closing. 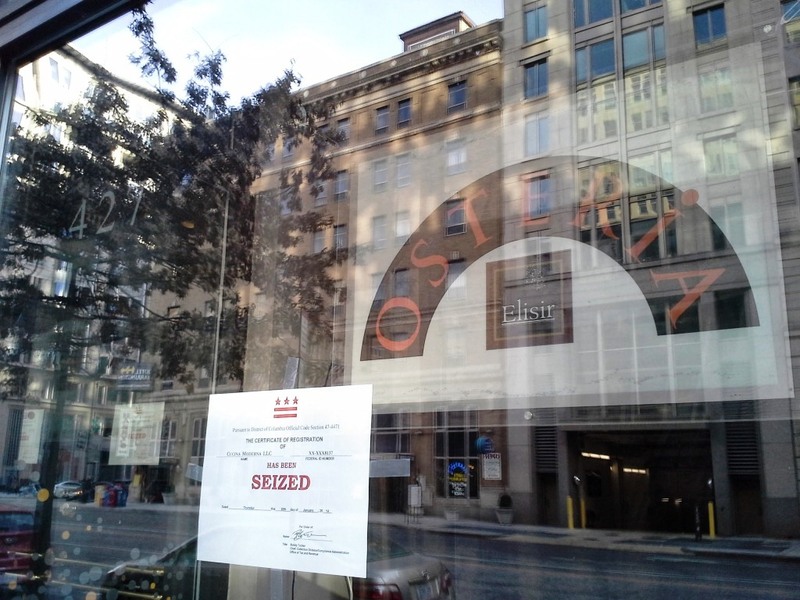 Rather jarring DC government signs with the big red word ‘SEIZED’ are now taped to the exterior windows which may suggest a less than happy ending (see photo below). The restaurant’s website still remains up. 4) Freshii (1005 E St NW) – The first notice of this closing came via a Penn Quarter Living tweet. We can’t say this surprised us as the experience here the two times we visited wasn’t worth repeating. This outlet used to be a Gifford’s Ice Cream shop which we say should be brought back! 5) Camille’s Sidewalk Cafe & Capital One Bank (650 F St NW) – A hat tip goes out to another Penn Quarter Living reader who pointed out that Camille’s is closed. Their website no longer shows any locations in DC. The Capital One bank outlet in the same building with F Street frontage is also closed. 6) News & Necessities (1250 H St NW) – This smaller newsstand near the Staples on H Street sold newspapers, lottery tickets, soda, candy, and other convenience items and a Penn Quarter Living reader alerted us that it appears to be closed. The phone goes unanswered and it sure looks closed to us. 7) Subway Sandwich Shop (709 H St NW) – We walked by this Subway and it is closed; it also no longer shows on Subway’s store locator. If you need your foot long sandwich fix, the 5th and D St NW or the 9th St (between E and F St NW) locations are not far away. So sad to see Tuscana West close. When we first moved to the Penn Quarter 10 years ago, we went there often, as there weren’t many restaurants here yet. Over time, will all of the choices here, we went less often. It was a great place; just wish it had been closer.